This week, Your News to Know rounds up the latest news involving gold and the overall economy. Stories include: Goldman raises its 2019 forecast for gold, gold will continue to shine in the face of growing risks, and ten reasons why gold will remain above $1,250 in 2019. After a volatile December across the board, Goldman Sachs sees gold even more appealing in 2019, reports CNBC. The bank upped its gold forecast for the current year to $1,325, $1,375 and $1,425 an ounce over the next three, six, and 12 months, respectively, amid mounting risks and an increase in defensive sentiment. In a note to clients, Goldman’s head of commodities research Jeffrey Currie said investors are quickly becoming aware that the period of easy money in the equity market could be over. The rough-and-tumble end of the year saw U.S. stocks post their worst December since the Great Depression, adding more fuel to concerns that another recession could be nearing. Gold outperformed the market in the same month with a return of more than 4%. Market fears were bolstered by a slew of disappointing data for December, which included the U.S. Purchasing Managers Index (PMI) falling to its lowest in 15 months and manufacturers’ confidence in business eroding close to a two-year low. Gold could also be helped along by a possible shift in Fed policy, said Currie, with officials showing a willingness to ease up on tightening due to growing market concerns. Currie added that gold will do well even in the case of successive hikes, as risk aversion far outweighs the perceived opportunity cost of owning gold. Currie also pointed to the recent increase in central bank gold demand, expecting the trend to continue throughout 2019. Like individual investors, Currie said that these institutions recognize the economic shift taking place and are positioning themselves accordingly. The latest analysis by the World Gold Council (WGC) forecasts higher gold prices in 2019 due to a return of defense-oriented investment. According to Kitco, the WGC’s 2019 Outlook, aptly named Rush To Safety, predicts that investors will shun riskier assets and seek shelter in the few havens available. Gold is likely to once again emerge as the top choice for risk management as Treasuries, the main haven competitor, find themselves on increasingly shaky ground. “In the U.S. the 10-year Treasury yield is 1.5% below its 2008 pre-Lehman crisis level, providing investors less cushion in case of further market volatility,” said the WGC in the report. The analysts went on to say that the bond market continues to signal a risk of recession as the yield curve flattens, which was one of the precursors to the 2008 crisis. This builds on general concerns that the global market could be heading towards a recession, fueled primarily by plummeting stocks, tighter monetary policies around the world and a fast-developing trade war between the U.S. and China. Regarding stocks, the analysts believe that last year’s corrections were merely the beginning of a trend, and that the market remains overvalued. The rise of protectionist policies in various countries around the globe could provide plenty of additional fuel for price gains, the analysts added. In such an environment, gold will not only be prized for its defensive utility but also as a measure to combat inflation. As gold aims to definitively breach the $1,300 level, Kitco’s David Erfle revealed ten reasons why he believes the metal will stay above $1,250 for the whole of 2019. The hundred-billion-dollar trade war between the U.S. and China, the effects of which have been aggravated by the recent federal government shutdown. Both U.S. and Asian stocks have already felt the consequences of Trump’s and Xi’s disagreements, and the downturn in equities is likely to continue. The U.S. faces additional hurdles as 2020 approaches, with a Democrat-controlled House butting heads with the Republican President. The possibility of Trump’s opposition gunning for impeachment adds another layer of turmoil and lowers citizens’ confidence in the government. The latest Federal Reserve meeting, which displayed uncharacteristically dovish sentiment among Fed officials. As the prospect of fewer rate hikes in 2019 becomes more probable, the U.S. dollar could find itself under heavy selling pressure. Additional support for gold from the silver market as the skewed gold/silver ratio finally normalizes. Population uprisings in the form of the Yellow Vest Movement, which started in France and has since branched off to Canada and Australia. With growing distaste for Brussels’ policies, there is a threat that the movement will eventually spread across the entire eurozone. Increasing complications surrounding Brexit and the British government’s inability to broker a satisfactory deal with the European Union. Already a boost to gold due to the strife surrounding it, a British exit without an EU agreement would intensify geopolitical concerns. More unrest from the eurozone as Italy, a major critic of Brussels’ budget policies, joins forces with Poland to form an anti-EU faction ahead of the EU elections in May. 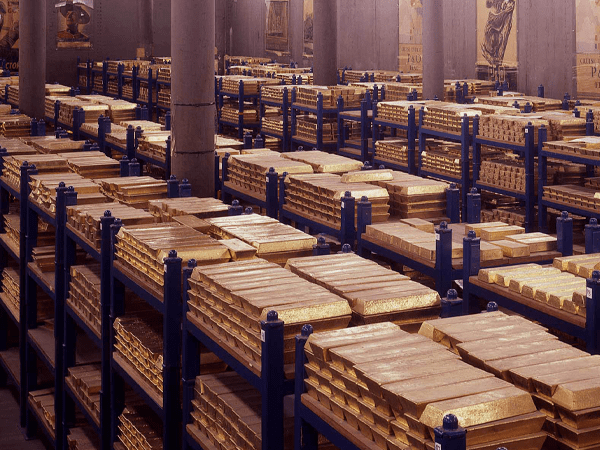 A substantial increase in gold holdings in some of the world’s largest related funds. Bullish movement in the gold chart as the metal forms a “U” bottom, which is considered a positive development compared to a “V” bottom.